The LA Mart building in downtown Los Angeles recently hosted the 24th annual Photo LA, an art exhibition that featured a diverse range of photographs. This highly-anticipated event allowed artists to share their work with thousands of guests over the course of four days. Additionally, there were amazing food vendors, booths with non-profit organizations, university panels, tours, lectures, and of course the chance to meet the artists themselves. The maze-like structure of the building consisted of never ending passageways filled with bright and evocative photographs. 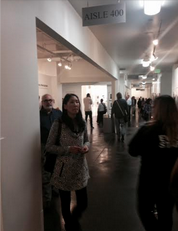 From the Women in Photography section to the mixed media and video installations, there was something for everyone. Three of my favorite artists were Luther Gerlach, Anna Carey, and Ralph Ziman. 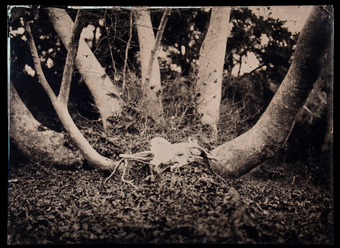 Using antique camera lenses, Luther Gerlach works with wet plate photography, also known as collodion photography. This is an early photographic technique that emerged in the 1850s where large glass plates are prepared using a darkroom and various chemicals such as silver cyanide. Gerlach has expanded on this technique and uses cameras of his own design that allow him to create extremely large photographs. Some are as big as 23 by 25 inches! His work usually features forest and nature scenes, sometimes with a human subject. The aged look really gives the piece a transcendent and other-worldly feel. 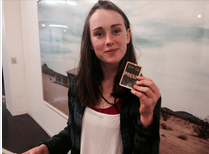 Anna Carey’s work features both model making and photography. 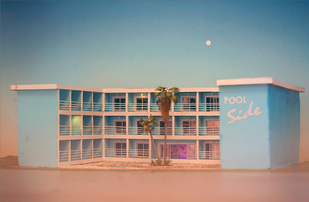 In her most recent series of photographs, Carey uses small models of different buildings to create an intriguing and whimsical world. I absolutely loved the different scenes that seemed so lifelike and from another time. 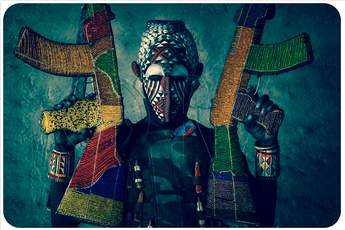 “GHOSTS” a series of photographs Ralph Ziman, depicts individuals carrying beaded AK 47s. This is social commentary on the state of weapons trade in Africa. Ziman states, “Arms that are paid for and imported into Africa are being used by individuals not just for defense but often by corrupt, autocratic governments to oppress their own people.” Both terrifying and beautiful, these pieces were some of my favorites. Photo LA was a great experience and I am excited about what it will bring next year. For more information visit http://www.photola.com/home.